NYC, 02/20/2019, 7:00PM. In the Midst of Winter: Three Lives Intersect. Isabel Allende's novel journeys from present-day Brooklyn to Guatemala in the recent past to 1970s Chile and Brazil. 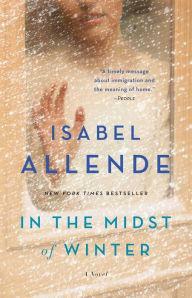 In the Midst of Winter is about three very different people who are brought together in a mesmerizing story that offers “a timely message about immigration and the meaning of home” (People).